Total refusals of shipments increased 52.4% from October 2017 to October 2018. Year-to-date there are 96 line item refusals compared to 63 at the same time last year. 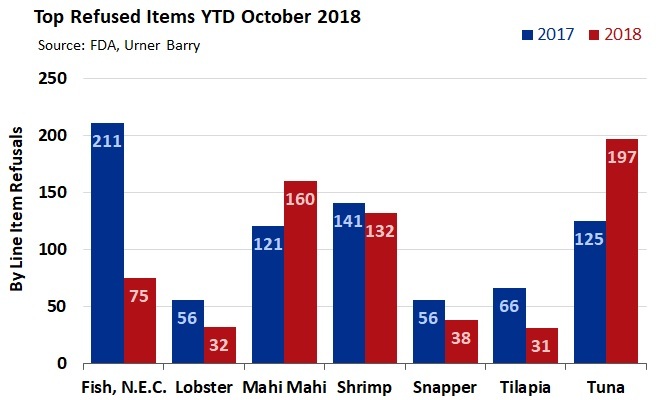 Tuna had the biggest YTD increase in October, with 197 line item refusals compared to 125 in October 2017. That’s a 57.6% increase. Mahi Mahi refusals also increased, with 160 line item refusals in October 2018 compared to 121 a year ago.